Survived 2008 okay? The year proved difficult for an already-disrupted industry, though "accelerated transition" could be the best description of current forces at work. As in previous years, consumers continued their shift towards digital formats, and free continued to beat paid. But a widespread economic downturn appears to be intensifying a long-running disruption. Major Labels Ending Lawsuits Against Individuals.... Now What? Just posted a new article/commentary by Paul Resnikoff of Digital Music News at http://www.musicbizacademy.com/articles/pr_labelsendlawsuits.htm . A good analysis of the recent announcement by the RIAA that they would no longer be bringing lawsuits against people sharing music on the Internet. They are taking a different approach to the problem, by working with ISPs to limit the account usage of copyright infringers. This morning, a new article posted at Digital Music News quoted Nielsen Soundscan as stating that the forth quarter of 2008 is "shaping up to be the worst decline in the history of the CD" in terms of sales. "In response, Wal-Mart has been driving the price of CDs southward, often below $5, and shrinking shelf-space aggressively. 'We suspect other retailers will follow Wal-Mart's lead and reduce CD floorspace significantly in 2009, as the format loses interest with consumers and ceases to be a traffic driver on 'new release' Tuesdays,' research analyst Richard Greenfield stated. Overall, CD sales are down about 20 percent from just a year ago. You can read the full article at http://www.digitalmusicnews.com/stories/112608fourth . Good reading. Sign up for their newsletter while you're there. It's terrific. I still think there is a place for the CD. There are a lot of folks of my generation (born in the 60's) and earlier who will never buy an iPod and who really aren't into the whole "digital music download" thing. If there's an album out there we really do want, we'll buy the CD. The problem is, there aren't that many albums we really want that we don't already have. Everything we were interested in "owning" we purchased years ago. And one of the things about getting older is that while we still enjoy listening to music, owning it just isn't as important anymore. The music we listen to doesn't "define our life" like it did when we were kids. So my generation still enjoys CDs, we just buy less of them... a LOT less of them. Frankly, I don't know what I'd do if someone handed me a stack of CDs like that. I'd never listen to them. Tell me I could have any 13 CDs I wanted from a stack of 1000 and I'd walk away. It's not worth my time to even look. Why? Because I'm listening to music online now. Between Internet Radio, Pandora, and my Rhapsody subscription, I'm set for life. I can listen to whatever I want, whenever I want. No physical CD necessary. Yea, I still buy CDs... maybe one a year. Maybe two. Three would be a lot. But 10 years ago? I probably bought two or three a month. Record companies, there's a big part of your declining market. The kids are aren't buying CDs because their going completely digital, buying downloads, putting them on their iPods, trading with their friends. The mature generation isn't buying CDs because we already own pretty much everything we ever wanted. And when we do listen to "new" music, we get it online. I probably buy more CDs as gifts for others than I buy for myself. Oh wait, that was LAST year! I didn't buy a single CD as a gift for anyone this year. MySpace Music: So, How Does it Look? "If music started and ended on the internet, then MySpace Music would be the end-all, be-all solution. Of course, music is enjoyed everywhere - on iPods, mobile devices, CD-Rs, automobiles, and laptops, and music fans demand transferability between different environments. They have also grown accustomed to free acquisition - and for some younger fans, music has always been free. That makes the MySpace Music proposition a bit incongruent with current listening and acquisition habits, though the concept still breaks some ground." "News Corp’s MySpace launches a new online music service on Thursday, aiming to loosen Apple’s grip on the US music industry and challenge all other online rivals. The service, MySpace Music, also aims to come to the aid of a music industry reeling from the continued slide in CD sales. MySpace Music is viewed by the music industry as an alternative to prior partnerships, most notably, its pact with Apple’s Steve Jobs. Label chiefs have long grumbled that Apple’s iTunes service is primarily designed to funnel profits back to Apple’s iPod and iPhone devices at the expense of the music industry. But so far, no contenders have managed to dent iTunes. It's been 2-3 weeks since I've posted here.... but I've been on concert tour. When I'm on tour, much of my time is spent on the road playing concerts and just trying to keep up with the "must-do" daily business stuff. Don't get as much "free time" to post newsworthy stuff here. 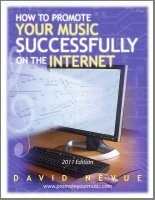 I'm sure you know how it is, music biz minded readers that you are. But here's a little article that came across my desk this last week that I wanted to share with you. As you may know (or perhaps you don't), MySpace is about to start streaming entire catalogs of music from SonyBMG, Univeral and Warner Music. And when people hear music they like on MySpace, they'll be able to create playlists, share them, and go right to Amazon.com to purchase the tracks for personal use. Amazon.com is hoping to start cutting into a bit of iTunes digital music dominance. The link to "20 Things to Do While You're Sitting Around Waiting for Your Fans to Show Up" was forwarded to me recently by an associate. It's an older blog (posted July 2007), but still very "current" in topic and worthwhile reading, especially if you're scratching your head thinking "what now?" in regards to promoting your music online. According to a new Billboard report, almost twice as many people perform artist searches on Wikipedia than they do on MySpace. And when a search is performed for an artist's name on Google or Yahoo, if a Wikipedia page entry exists for that artist or band, people will choose to view the Wikipedia page for that artist twice as often as they will choose the MySpace page for that same artist. Wikipedia artist page results are also selected more often than "official web site" pages. What does this mean to you? It means you need to create an page entry for your artist or band on Wikipedia to take advantage of this fact.